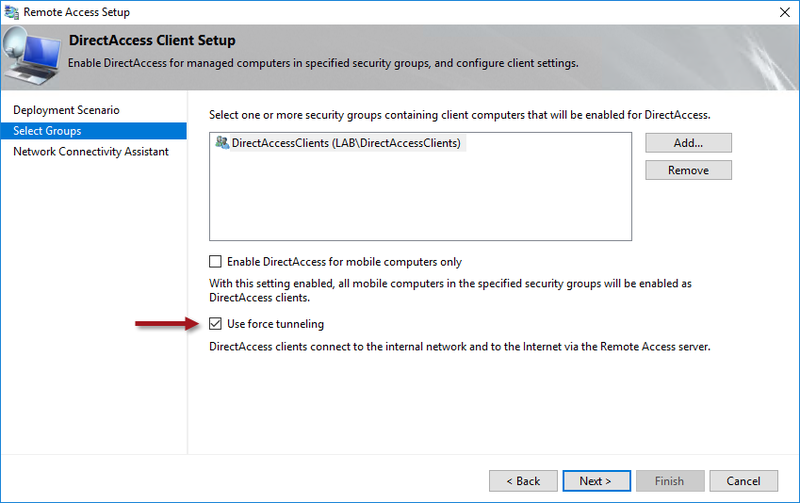 DirectAccess Force Tunneling and Proxy Server Configuration | Richard M. Hicks Consulting, Inc.
We have a problems with force tunneling, when i activated force tunnelig, the connection is ok but i can resolve any hostname, internal or internet, without force tunneling work correctly. That’s unusual, and it could be caused by any number of things. I can only suggest that you make sure you are testing with a client that has updated group policy while on the LAN after enabling force tunneling. I can tell you from experience though that force tunneling can be temperamental, and it quite often doesn’t work like you expect it to. when force tunneling is enabled, does all the internet-bound client traffic simply go out through the DA server(s), or is the separate outbound proxy required? With force tunneling enabled, all client traffic is routed over the DirectAccess connection. For traffic bound for the Internet it will be routed through the DirectAccess server, but because of the limitations of the IPv6 translation technologies it typically doesn’t work. In most cases you’ll need to define a proxy server for Internet traffic to work correctly. This is one of the challenges we are facing. We use a proxy server, but we also use WPAD to specify what traffic should go through the proxy and what should go directly to the Internet. This is mostly for traffic like Office 365. I understand that split tunneling would be better in this scenario? Do you know if adding WPAD to the NRPT table will be enough to allow a DA client detect it? There are a couple of ways to approach this. First, you could add the specific domains you want to route over the VPN connection using the DomainNameInformation node and then specify the WebProxyServer information there. You could also define a proxy using the Proxy node and then specify either Manual or AutoConfigUrl. You’ll have to do some testing to see which works best in your case. Apologises if i missed it but is there a way to have the scripts run automatically once a connection to DA is established. Our issue is we manually set proxies but running into issues when users are connecting to wifi systems that require authentication through splash/landing pages so they cant authenticate. so looking for alternatives. Also looking into wpad. You could probably do something on the client using event triggers, but that’s not something I’ve ever done. Not sure if WPAD is going to work like you expect, unfortunately. DirectAccess force tunneling is terribly inelegant and quite difficult to make work correctly. Can’t go on the Internet with them. Correct. The limitation with this configuration is that third-party browsers don’t work with it. I’m not aware of any alternatives either, unfortunately. First of all, thanks for all of your instructions! You’ve been so helpful! Second, i have questions about the proxy needed for forced tunneling. You say to add the proxy server to the client configuration, but we never set up a proxy server. Where does that get set up at? What type of proxy server is this? Is the DA server already a proxy server, we just need to point the clients to the DA server, or is there another server we need to be configuring with some other proxy service that will do this translation for us? Thank you very much, that helped and I was able to stand up a squid server and got it going…! well… partly. It seems as though any physical clients, windows 10 enterprise, will not connect via DA. In my test lab, I’m setting up my domain controllers, DA server, and proxy server inside of Microsoft Azure (i know, not supported…). When I enabled forced tunneling and got the proxy server settings configured properly, my windows VM client(residing on my physical machine here at home, Windows 10, version 1709, LTSB), works just fine. I am able to use an internet browser on the VM and reach the internet, confirmed in squid logs, while still accessing internal corporate resources. If I go through the same process on an actual physical laptop with Windows 10, 1709, enterprise, it does not allow me to connect to the internet or corporate resources. Collecting a log seems to hang and never completes, but running through basic troubleshooting doesn’t display anything obvious wrong. I realize this is a long winded question, so maybe we need to do some actual consulting through you or maybe there is some other way we can get more advanced help.. 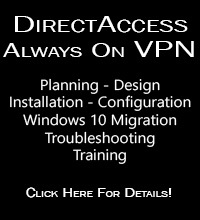 Typically if a DirectAccess server will support one connection, it will support many. If some clients can connect and others can’t, that would seem to indicate something wrong with the client configuration. I’d look closely at your client to make sure it has met all the prerequisites (firewall on, certificates provisioned, has the DirectAccess client policy, etc.). Turns out that my VM on Windows 10 Enterprise 1709 LTSB worked fine without a computer certificate issued. After creating an internal CA and issuing the correct certificates, my Windows 10 Enterprise 1809 laptop also began working fine with forced- tunneling enabled. Your books troubleshooting section pointed me in the correct direction. Once I found that the laptop’s IPSec connections were not being made, yet I was able to ping the remote endpoints, it all clicked. Thank you Richard for your blogs. I activated the force tunneling, all traffic go to direct acces tunnel and the ressource access works. However, the workstation indicate “no internet access” ! Do a proxy is mandatory with force tunneling ? i have no execute the command set-dadnsclientconfiguration for example. This is one of those irritating side effects of enabling force tunneling. If you have enabled force tunneling it is highly recommended that you configure all of your client web traffic to use a proxy server. Sometimes this fixes the NCSI behavior, sometimes it doesn’t. 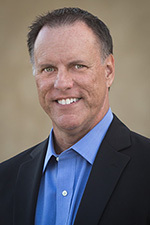 Typically it’s nothing more than an annoyance, but sometimes it does negatively affect client connectivity. You might also consider making some changes to the way NCSI performs detection. For example, you could try disabling active probing to see if that helps. Details here: https://docs.microsoft.com/en-us/previous-versions/windows/it-pro/windows-vista/cc766017(v=ws.10). 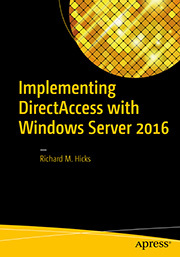 DirectAccess Selective Tunneling | Richard M. Hicks Consulting, Inc.